Scotland have been rewarded for a highly successful Autumn international campaign with a move up the World Rugby Rankings. Gregor Townsend has built on the significant progress made by former coach Vern Cotter with victories over Australia and Samoa, and his side were within a whisker of beating the All Blacks – something that has been reflected in the rankings that will be announced by World Rugby tomorrow. Scotland’s record victory over Australia, coupled with Wales’ win over South Africa yesterday, has seen the men in blue leapfrog the Boks and regain the 5th spot – a place they held for the first time ever earlier this year following their own win over Wales in the Six Nations. The sides sitting above them are New Zealand (1st), England (2nd), Ireland (3rd) and the Australians (4th) who Scotland thrashed last week. 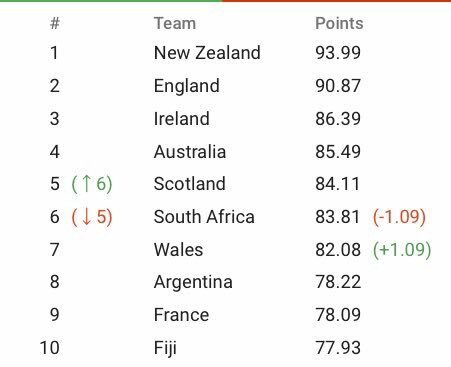 Should Scotland have a successful Six Nations then they will be on course to replace Australia and reach their highest ever World Rugby ranking of 4th. What do you think of the new ranking? Can Scotland go higher still? Let us know in the comments below. Well done lads keep it up!!! Didn’t expect anything else ! Groovy – let’s keep attendance high at Glasgow/Edinburgh games, folks. Outstanding Scotland, so exciting to watch! Time to take on the Irish. Who would have thought that targeting 3rd place was even the slightest bit achievable. Even if only until the Ozzies sort themselves out…. They probably deserve to be 4th, after back to back wins over the wallabies hard not to see them as the 4th best team in the world, heady days for Scottish rugby. This team right now are amazing! Cant help to think there is more to follow as the team matures. Well deserved after a fabulous campaign!! Please smash England. Long overdue – and a true test. From an American rugger, really glad to see this progression from Scotland. They’re playing out of their minds right now. Keep at it! Looking forward to the 6N and also the RWC ’19 in Japan… As with all sports, the important games are the upcoming ones, not the previous ones! Woop woop!!! Roll on 4th place, then 3rd…. Well deserved, keep the momentum going!! Not sure England deserve 2nd TBH. Very well deserved and they should go higher yet. This is a tribute to the work of Vern and Toonie. It really does make up for those miserable Murrayfield days when we were humped without even a whimper. Fantastic season Scotland. Well done. Way proud of the team ??? Frankly I think Scotland should be above OZ and Irish, who are completely over rated. This is the best chance in 20 years to win the six nations – and I think we will in 2018. Back in top 5 Michael Maslin should really be fourth! Here’s hoping for a successful Six Nations so you can leapfrog Oz. That would make this Kiwi very happy. Outstanding effort Scotland the brave! Great recognition for the team and coaches. Well done all. Very well deserved for an outstanding effort.